Amid Amidi's much-anticipated Cartoon Modern has finally arrived in my mailbox. Tantalized by the graphic "leftovers" Amid's been posting these past months on his concurrent blog, my expectations were high. 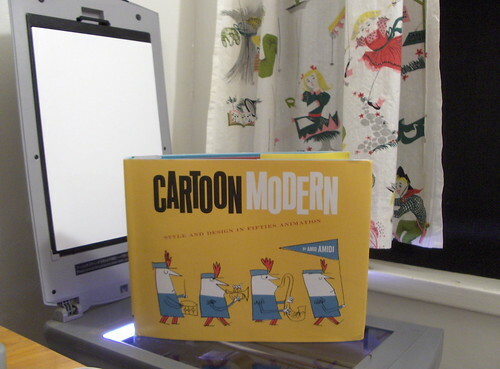 I'm happy to report that the book lives up to and exceeds my hopes and then some--it's a very handsomely produced volume focusing on the insanely fertile midcentury modern period of American animation, both commercial and theatrical. The publisher, Chronicle, has a well-earned reputation for excellent, attractive layout and design and their approach is a perfect fit with the subject matter, tailor-made for prominent placement on coffee tables of design and animation lovers everywhere. 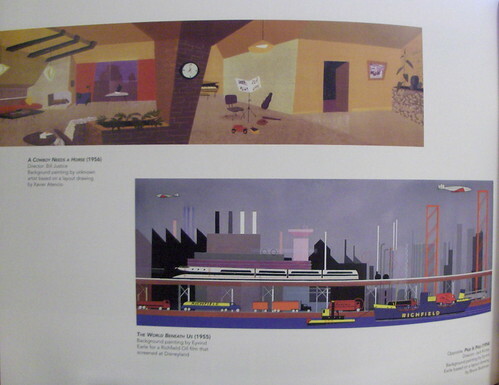 "Cartoon Modern-style and design in fifties animation" is arranged as a encyclopedia of studios, from Academy Pictures to Warner Bros., each chapter filled with eye-popping and mostly, I'm sure, unpublished designs, character models, backgrounds, storyboards--you name it. Leafing through the 200 pages I'm struck with the caliber of work from studios I've never heard of in my life: Elektra Films, Grantray-Lawrence Animation, Academy Pictures--next to Disney, UPA, Playhouse, Warner Bros. and a dozen others. The time span covered is surprisingly short--barely more than ten years, and the same names(Hubley, for instance)pop up in more than one entry. There's an addendum on the international scene and even a fascinating black-and-white "Yearbook" section of photographs of almost all the noted artists. I haven't even begun to really dig in, but it's gorgeous, inspiring, and obviously fills a pretty fair-sized gap in animation history to date. This is one of those titles that everyone reading this just has to have. My few poor scans are nothing...it must be seen and savored to be truly appreciated. Availiable now from Amazon, and at your local bookstore. Wow! Good for Amid! I can't wait to get a copy! Wonderful! I'll be ordering a copy for myself just as soon as I get paid! I received the latest issue of (the absolutely fantastic) Animation Blast in the mail today which should keep me busy until I manage to get hold of a copy. OHMYGOSH! 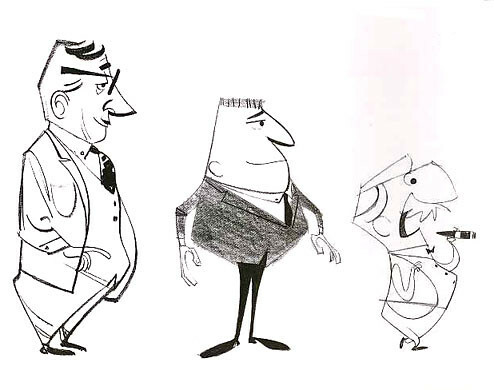 I remember seeing that background pinned to a board in Bill Justice's unit on the second floor of the Animation Building back in the fifties. I knew that BG the minute I saw it. Felt like I had shot back several decades in the wink of an eye. I've always love that Disney short. Don't know how you got this stuff, but I'm glad you did. Floyd, that's got to be like instant time travel, alright! I can't imagine seeing that in person--on the scene...wow. Amid knows where all of these originals came from(he mentions various private collections in his acknowledgments, and I'd guess the Disney archives too would have helped). Say-wouldn't it be fantastic to have a show curated from this material? UCLA has a gallery, and there are others that would be nice venues. MOCA, perhaps? I wish that could happen. Why not? Yikes! It's got a 1-2 month lead time on Amazon now! Looks like I'll be getting it for Christmas then... You think Amid has a secret stash of these somewhere? antikewl--Amid has just posted on his own Cartoon Modern-specific blog that Chronicle is in the process of a bulk shipment to Amazon that, once received, will enable them to do 24-hour time-frame shipping. It hasn't kicked in yet, I guess, but I'd think any day so check back on Amazon(or on Amid's blog). I've seen them in bookstores around town here in San Francisco. Take a walk and check with your local bookseller too! I just got this last week. It's one of the best art history textbooks I own. And seeing as my wife's a painter, we have plenty. Amid's work has paid off and then some! I want to know where you got those curtains! Ha! You get exactly one guess, Count. Give up? I'll bet you guessed it...yes, Ebay! And they are indeed keen...I'll just add to your drooling envy by saying they didn't show up on anyone else's radar as I got them for under 10 bucks. Usually my Ebay luck is so lousy I don't even bother. Don't they make a nice backdrop for Amid's book there? Animation story artist. Calarts '90. Author of "The Art of Disney/Pixar's Brave", from Chronicle Books.